Paddle, Hook Type, 4-1/2 ft. These paddles are packed 6 per box. 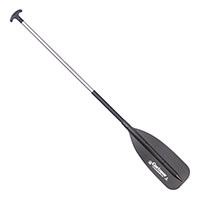 The SP Synthetic Boat Paddle has a 6-1/8" blade width that meets the demand of the traditional boat paddle customer. It has a comfortable palm grip, fully plastic clad aluminum shaft and full aluminum reinforced high impact plastic blade. It is practically maintenance free and a must for the fall duck hunterand commercial fisherman. The SP paddles are packed 12 per box. Paddle, Traditional , 4-1/2 ft.